How to get the perfect surround sound, theatre experience in your living room. A theatre-like set-up at home is incomplete without a good projector, powerful audio system and, of course, a tub of popcorn. The market is teeming with projectors and soundbars in a range of shapes, sizes and price points. Among them, the BenQ W1700 stands out as a notable and affordable 4K projector, while the JBL Bar 2.1 soundbar delivers a promising audio experience. Bringing home the enthralling cinematic experience using a 4K projector and a large flat panel TV is a tempting and, at the same time, an expensive proposition - 4K projectors from brands such as Sony and JVC are priced upwards of Rs 3 lakh. But BenQ's W1700 home cinema projector, priced at Rs 2,25,000, panders to your whim without leaving you feeling guilty for the indulgence. A compact conventional-looking projector, BenQ W1700 can be mounted on the ceiling or placed on a table. It houses a lens in the front, grills on the right, connectivity ports at the rear and physical controls, zoom and manual focus controls at the top. 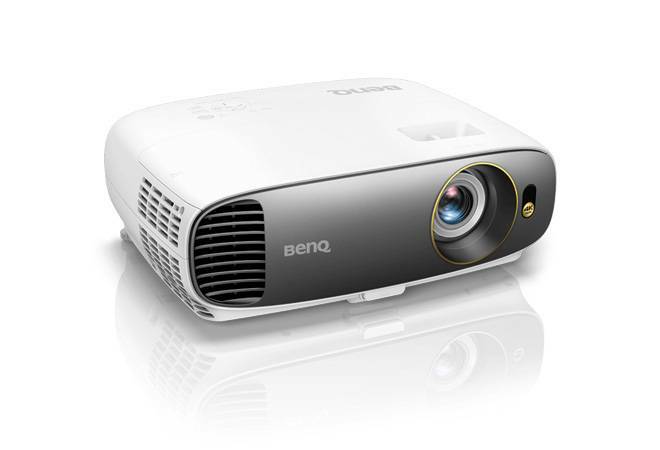 BenQ has added a host of connectivity options - two HDMI ports, PC and VGA port and USB port for power along with audio in and out - as well as a backlit remote that is handy when operating the projector in the dark. BenQ packs in a 0.47" single-DMD DLP technology - one of the best in the market - with 3,840x2,160 native resolution and 2200 ANSI lumens lamp that creates a 200-inch screen easily. This projector is ready for use right out of the box. All one has to do is plug in the power cable and connect to the source. When turned on, it automatically searches for the source; it can be swapped manually, too. When the projector is tilted/off-centre, rendering a trapezoid effect, the auto keystone setting comes in handy; it re-aligns the projection for comfortable viewing. The projected content was sharp and the colours produced were brilliant. The preset modes - bright, vivid TV, cinema and sports - let you customise settings as per your liking. To adjust the focus, one has to use the controls on top of the projector. The sound output of the 5W speaker is good, but does not quite fit in with the cinema set-up. Plugging in a solid soundbar, like the JBL Bar 2.1, is a good idea. The lifespan of a projector lamp is crucial. BenQ W1700 claims it is close to 4,000 hours on normal usage, can stretch up to 8,000 hours on SmartEco mode and 10,000 hours on economic mode. The simple design of the all-black JBL Bar 2.1 soundbar makes it blend perfectly with home interiors, whether it is placed flat or mounted on the wall. What it will also do is enhance your entertainment experience by several notches. The JBL Soundbar has a front display, physical controls on top, connectivity options at the rear (including HDMI ARC, Bluetooth, auxiliary, SPDIF and USB), four 2.25-inch drivers and two 1.25-inch tweeters. It also comes with 6.5" wireless subwoofer and a remote. It was ready to plug and play, when connected with the TV using the HDMI ARC, or with the BenQ W1700 projector using the auxiliary cable or my phone over Bluetooth. It also supports the SPDIF (Sony/Philips Digital Interface) connectivity option for which a cable is duly bundled in the box. The JBL soundbar offers impeccably clear sound in the standard mode. One can choose from audio modes to go with the genre of content watched - movies, sports, voice and music. In the movie mode, the dialogue delivery was crisp without the highs being compromised. The music mode was ideal when streaming music over YouTube on TV or the smartphone as well. The wireless subwoofer offered deep bass which is adjustable. The night mode on the remote was a blessing; when turned on it automatically balanced the loud sounds, but works only with Dolby Audio. Multiple remotes to control different gadgets can be a nuisance; thankfully, there is an option to control the soundbar using the TV's remote (works with select TVs). If an immersive audio experience is what you seek, the JBL Bar 2.1 wireless soundbar, priced at `23,499, will be a sound addition to your home theatre set-up.